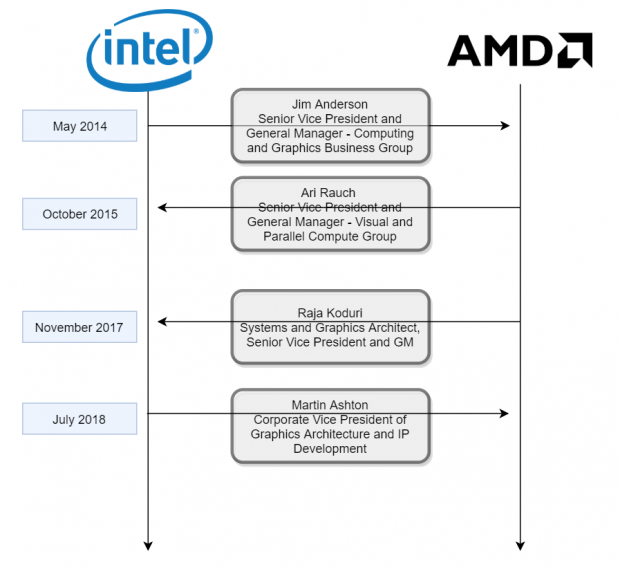 Almost as a sequel to my editorial about the Talent Wars, AMD announced Martin Ashton, the former Vice President of the Core and Visual Computing Group responsible for graphics architecture and IP development at Intel, has joined AMD. Prior to Intel, Martin worked for 23 years at Imagination Technologies as the Executive Vice President of the PowerVR business unit. Since David Wang joined AMD in January as senior vice president of engineering for RTG, his top priority has been to strengthen AMD graphics engineering leadership. Aston will be the new Corporate Vice President of Graphics Architecture and IP Development. He’ll be reporting to David Wang. Wang, and AMD are hoping Ashton’s experience in developing low power, high efficiency graphics architecture and IP will help the company in its effort to drive performance-per-watt and performance-per-area improvement of the Radeon product families as well as AMD’s graphics roadmap and business. The trail between AMD and Intel is well worn, here a few of the higher profile examples. It has been said, that there are really only 100 engineers in Silicon Valley but they move around so much it seems like much more. Certainly, it’s also true that engineers can not be created or destroyed – just irritated a whole lot, when that happens the energy builds up and they move to another company. Glad I could explain that for you.